If you are exhibiting at the Long Beach Expo for the first time, there are some things you will need to know beyond the obvious like show hours and convention location. Here are some of the more frequently asked questions we receive from new dealers. What are the sizes of the booths? Each table has decorator pipe and drape and is ready for you to do business! Your exhibitor sign will display your company name, city/state of business and your booth number. You will have chairs inside and outside your booth. You have an electrical outlet to plug in computers, lamps, credit card machines, etc. Extra extension cords, display cases and lamps are available. We also provide trash bags and table covers. Speaking of display cases, what size are they? They are standard-sized aluminum display cases at 24" x 36" x 4". I have my own company sign I'd like to hang. Is that okay? Absolutely. However, it cannot hang lower than 24" from the pipe for security reasons. I'm arriving the day before Dealer Setup Day and I don't feel comfortable leaving my coins in the hotel. Is there anywhere I can store them safely? We offer a security room beginning Tuesday at 11 a.m. and ending when the floor opens to dealers on Wednesday at noon. My wife wants to join me but I already have three assistants plus myself at the booth. Do I need to pay for an extra badge for her? No, immediate family members do not count against your four-badge-per-booth allotment. I was looking at the floor plan and I have my eye on a booth but I was told it was a "TSO." What exactly does that mean? A "TSO" indicates that the booth is available "This Show Only" because another exhibitor has already placed a deposit on it for the following show. I need wireless Internet at the show. How does that work? There is no need for you to order Wifi because we are giving it to you FREE. Please check with us on Dealer Setup for a user name and password. This is just one way for us to say THANK YOU to our valued exhibitors. I am going to need to have some things FedEx'd to me on Dealer Setup Day. Will you sign for them if I arrange for morning delivery? Good news! We won’t have to sign for your packages – you will be able to. We prearrange a set schedule with FedEx to ensure that you will be able to sign for your packages directly. They will deliver only during dealer hours and we will make lots of announcements so you can sign for your packages at our information booth. Who is Global Experience Specialists (GES)? What do they provide? Global Experience Specialists (GES) is our contracted decorator. They provide the tables, chairs, hanging signs, carpeting... a lot of what you see is provided or set up by GES. If you need to purchase an extra table, want an ergonomic office chair etc., GES is who you need to contact. Click here for the GES order forms if you anticipate having any additional needs at your booth. Hurry because they have some incentive prices if you order ahead of time! 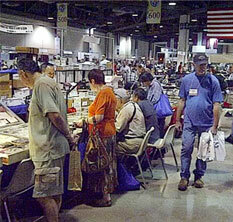 I've heard that the California Tax Board will require me to have a CA Seller's Permit to exhibit at your show. Where do I get that? You may apply online for it at http://www.boe.ca.gov/info/reg.htm. With regard to the CA Seller's permit, am I going to run into issues with the Nexus? Under the current parameters, Nexus only occurs if you do business for more than 15 days in California. Please familiarize yourself with the current definition of Nexus as it applies to you at http://www.boe.ca.gov/sutax/6203.htm. I want carpet in my booth. Can you order it for me? Carpet comes standard with all A Section, Beachfront and Boardwalk booths. Otherwise, you need to order it through our decorator GES. If you want a different chair, more tables and/or need to coordinate freight handling please click here for the necessary forms.